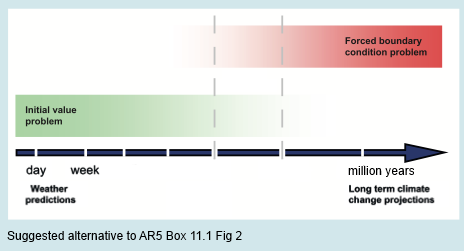 In (still) writing what was to be Part Six (Attribution in AR5 from the IPCC), I was working through Knutson et al 2013, one of the papers referenced by AR5. 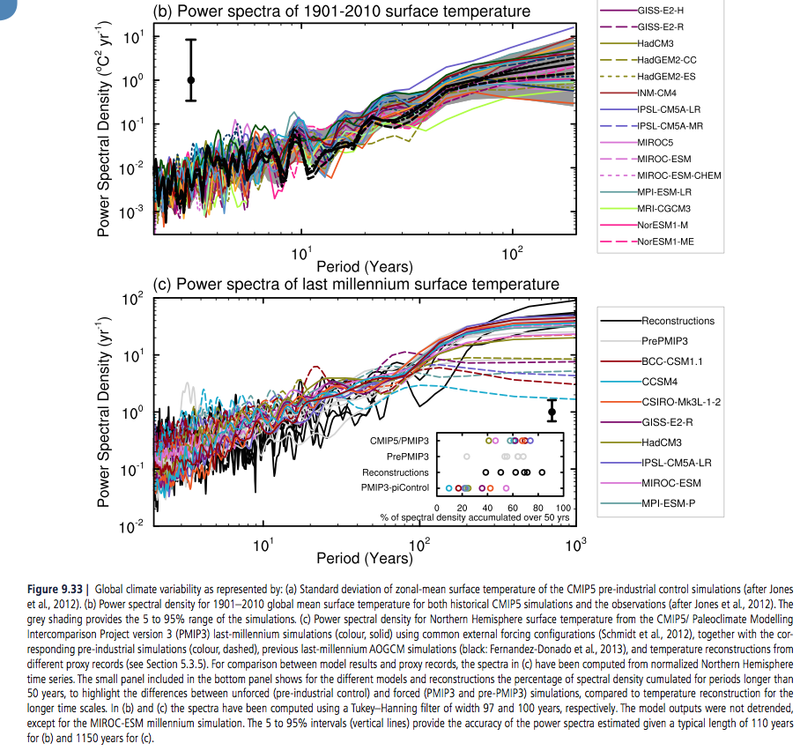 That paper in turn referenced Are historical records sufficient to constrain ENSO simulations? [link corrected] by Andrew Wittenberg (2009). This is a very interesting paper and I was glad to find it because it illustrates some of the points we have been looking at. It’s an easy paper to read (and free) and so I recommend reading the whole paper. CM2.1 played a prominent role in the third Coupled Model Intercomparison Project (CMIP3) and the Fourth Assessment of the Intergovernmental Panel on Climate Change (IPCC), and its tropical and ENSO simulations have consistently ranked among the world’s top GCMs [van Oldenborgh et al., 2005; Wittenberg et al., 2006; Guilyardi, 2006; Reichler and Kim, 2008]. The coupled pre-industrial control run is initialized as by Delworth et al. , and then integrated for 2220 yr with fixed 1860 estimates of solar irradiance, land cover, and atmospheric composition; we focus here on just the last 2000 yr. 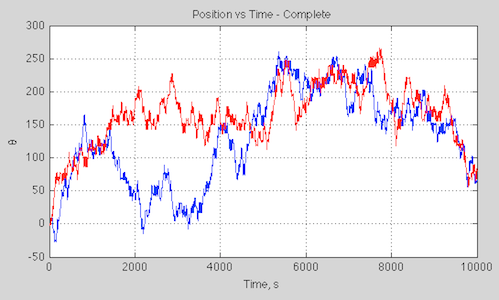 This simulation required one full year to run on 60 processors at GFDL. First of all we see the challenge for climate models – a reasonable resolution coupled GCM running just one 2000-year simulation consumed one year of multiple processor time. Wittenberg shows the results in the graph below. At the top is our observational record going back 140 years, then below are the simulation results of the SST variation in the El Nino region broken into 20 century-long segments. There are multidecadal epochs with hardly any variability (M5); epochs with intense, warm-skewed ENSO events spaced five or more years apart (M7); epochs with moderate, nearly sinusoidal ENSO events spaced three years apart (M2); and epochs that are highly irregular in amplitude and period (M6). Occasional epochs even mimic detailed temporal sequences of observed ENSO events; e.g., in both R2 and M6, there are decades of weak, biennial oscillations, followed by a large warm event, then several smaller events, another large warm event, and then a long quiet period. 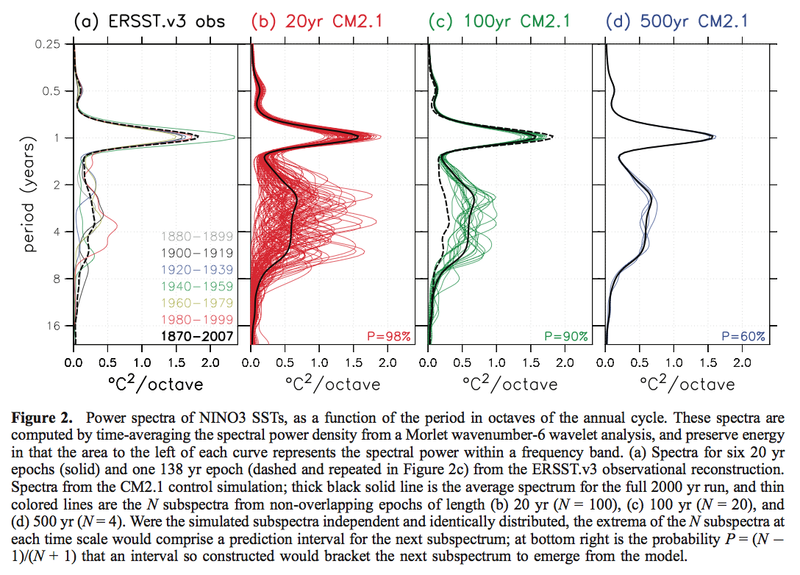 Although the model’s NINO3 SST variations are generally stronger than observed, there are long epochs (like M1) where the ENSO amplitude agrees well with observations (R1). An unlucky modeler – who by chance had witnessed only M1-like variability throughout the first century of simulation – might have erroneously inferred that the model’s ENSO amplitude matched observations, when a longer simulation would have revealed a much stronger ENSO. If the real-world ENSO is similarly modulated, then there is a more disturbing possibility. Had the research community been unlucky enough to observe an unrepresentative ENSO over the past 150 yr of measurements, then it might collectively have misjudged ENSO’s longer-term natural behavior. In that case, historically-observed statistics could be a poor guide for modelers, and observed trends in ENSO statistics might simply reflect natural variations..
..A 200 yr epoch of consistently strong variability (M3) can be followed, just one century later, by a 200 yr epoch of weak variability (M4). Documenting such extremes might thus require a 500+ yr record. Yet few modeling centers currently attempt simulations of that length when evaluating CGCMs under development – due to competing demands for high resolution, process completeness, and quick turnaround to permit exploration of model sensitivities. Model developers thus might not even realize that a simulation manifested long-term ENSO modulation, until long after freezing the model development. Clearly this could hinder progress. An unlucky modeler – unaware of centennial ENSO modulation and misled by comparisons between short, unrepresentative model runs – might erroneously accept a degraded model or reject an improved model. ..time-mean spectra of the observations for epochs of length 20 yr – roughly the duration of observations from satellites and the Tropical Atmosphere Ocean (TAO) buoy array. The spectral power is fairly evenly divided between the seasonal cycle and the interannual ENSO band, the latter spanning a broad range of time scales between 1.3 to 8 yr. So the different colored lines indicate the spectral power for each period. The black dashed line is the observed spectral power over the 140 year (observational) period. This dashed line is repeated in figure 2c. The second graph, 2b shows the modeled results if we break up the 2000 years into 100 x 20-year periods. So what this says, paraphrasing and over-simplifying: “we are 90% sure that the observations can’t be explained by the models”. Of course, this independent and identically distributed assumption is not valid, but as we will hopefully get onto many articles further in this series, most of these statistical assumptions – stationary, gaussian, AR1 – are problematic for real world non-linear systems. To be clear, the paper’s author is demonstrating a problem in such a statistical approach. Models are not reality. 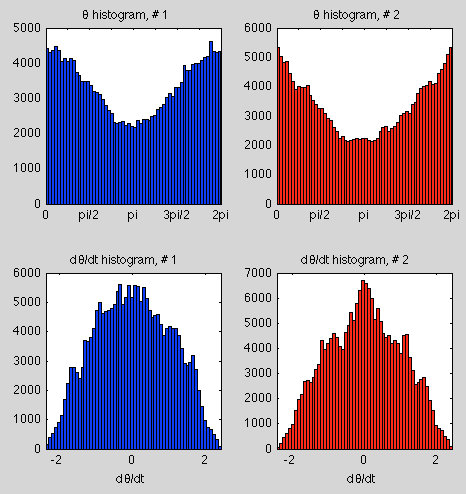 This is a simulation with the GFDL model. It doesn’t mean ENSO is like this. But it might be. The paper illustrates a problem I highlighted in Part Five – observations are only one “realization” of possible outcomes. The last century or century and a half of surface observations could be an outlier. The last 30 years of satellite data could equally be an outlier. Even if our observational periods are not an outlier and are right there on the mean or median, matching climate models to observations may still greatly under-represent natural climate variability. Non-linear systems can demonstrate variability over much longer time-scales than the the typical period between characteristic events. We will return to this in future articles in more detail. Such systems do not have to be “chaotic” (where chaotic means that tiny changes in initial conditions cause rapidly diverging results). What period of time is necessary to capture natural climate variability? More worryingly, if nature’s ENSO is similarly modulated, there is no guarantee that the 150 yr historical SST record is a fully representative target for model development.. ..In any case, it is sobering to think that even absent any anthropogenic changes, the future of ENSO could look very different from what we have seen so far. The formulation and simulation characteristics of two new global coupled climate models developed at NOAA’s Geophysical Fluid Dynamics Laboratory (GFDL) are described. 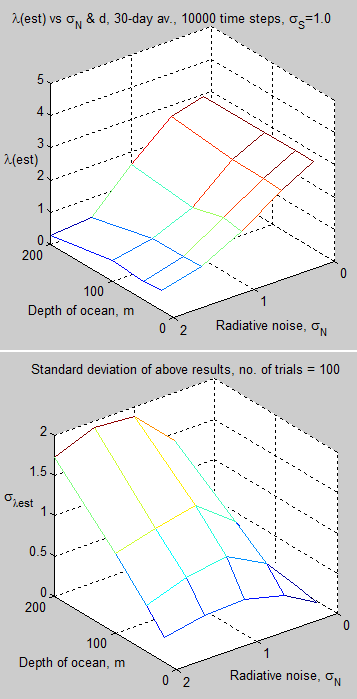 The models were designed to simulate atmospheric and oceanic climate and variability from the diurnal time scale through multicentury climate change, given our computational constraints. In particular, an important goal was to use the same model for both experimental seasonal to interannual forecasting and the study of multicentury global climate change, and this goal has been achieved. Two versions of the coupled model are described, called CM2.0 and CM2.1. The versions differ primarily in the dynamical core used in the atmospheric component, along with the cloud tuning and some details of the land and ocean components. For both coupled models, the resolution of the land and atmospheric components is 2° latitude x 2.5° longitude; the atmospheric model has 24 vertical levels. The ocean resolution is 1° in latitude and longitude, with meridional resolution equatorward of 30° becoming progressively finer, such that the meridional resolution is 1/3° at the equator. There are 50 vertical levels in the ocean, with 22 evenly spaced levels within the top 220 m. The ocean component has poles over North America and Eurasia to avoid polar filtering. Neither coupled model employs flux adjustments. The control simulations have stable, realistic climates when integrated over multiple centuries. Both models have simulations of ENSO that are substantially improved relative to previous GFDL coupled models. The CM2.0 model has been further evaluated as an ENSO forecast model and has good skill (CM2.1 has not been evaluated as an ENSO forecast model). Generally reduced temperature and salinity biases exist in CM2.1 relative to CM2.0. 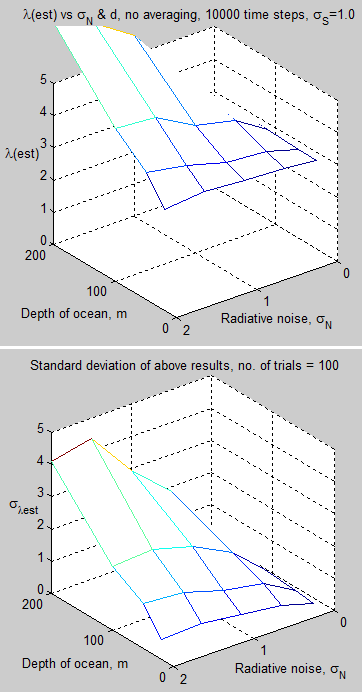 These reductions are associated with 1) improved simulations of surface wind stress in CM2.1 and associated changes in oceanic gyre circulations; 2) changes in cloud tuning and the land model, both of which act to increase the net surface shortwave radiation in CM2.1, thereby reducing an overall cold bias present in CM2.0; and 3) a reduction of ocean lateral viscosity in the extra- tropics in CM2.1, which reduces sea ice biases in the North Atlantic. Both models have been used to conduct a suite of climate change simulations for the 2007 Intergovern- mental Panel on Climate Change (IPCC) assessment report and are able to simulate the main features of the observed warming of the twentieth century. The climate sensitivities of the CM2.0 and CM2.1 models are 2.9 and 3.4 K, respectively. These sensitivities are defined by coupling the atmospheric components of CM2.0 and CM2.1 to a slab ocean model and allowing the model to come into equilibrium with a doubling of atmospheric CO2. The output from a suite of integrations conducted with these models is freely available online (see http://nomads.gfdl.noaa.gov/). There’s a brief description of the newer model version CM3.0 on the GFDL page. I’ve had a question about the current approach to climate models for some time and found it difficult to articulate. In reading Broad range of 2050 warming from an observationally constrained large climate model ensemble, Daniel Rowlands et al, Nature (2012) I found an explanation that helps me clarify my question. This paper by Rowlands et al is similar in approach to that of Stainforth et al 2005 – the idea of much larger ensembles of climate models. The Stainforth paper was discussed in the comments of Models, On – and Off – the Catwalk – Part Four – Tuning & the Magic Behind the Scenes. For new readers who want to understand a bit more about ensembles of models – take a look at Ensemble Forecasting. So multiple simulations are run and the frequency of occurrence of, say, a severe storm tells us the probability that the severe storm will occur. Given the short term nature of weather forecasts we can compare the frequency of occurrence of particular events with the % probability that our ensemble produced. Let’s take an example to make it clear. Suppose the ensemble prediction of a severe storm in a certain area is 5%. The severe storm occurs. What can we make of the accuracy our prediction? Well, we can’t deduce anything from that event. Why? Because we only had one occurrence. Out of a 1000 future forecasts, the “5%ers” are going to occur 50 times – if we are right on the money with our probabilistic forecast. We need a lot of forecasts to be compared with a lot of results. Then we might find that 5%ers actually occur 20% of the time. Or only 1% of the time. Armed with this information we can a) try and improve our model because we know the deficiencies, and b) temper our ensemble forecast with our knowledge of how well it has historically predicted the 5%, 10%, 90% chances of occurrence. This is exactly what currently happens with numerical weather prediction. 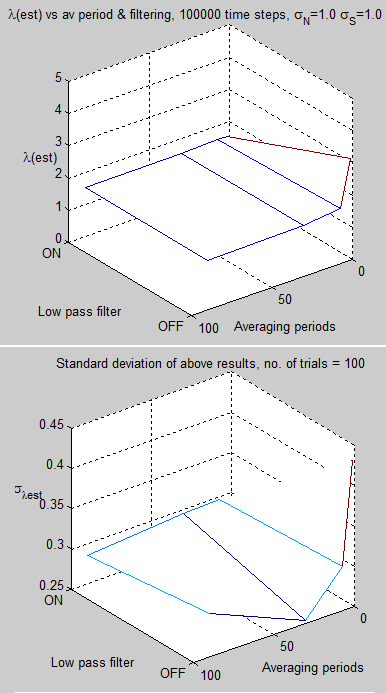 And if instead we run one simulation with our “best estimate” of initial conditions and parameters the results are not as good as the results from the ensemble. The idea behind ensembles of climate forecasts is subtly different. Initial conditions are no help with predicting the long term statistics (aka “climate”). But we still have a lot of uncertainty over model physics and parameterizations. 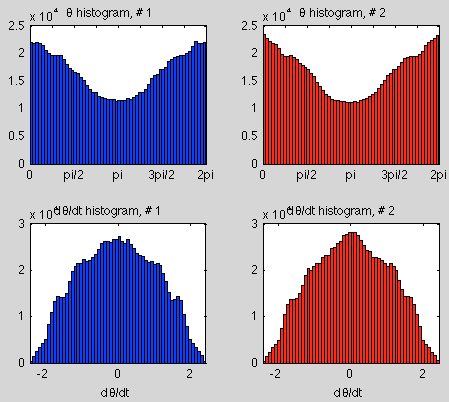 So we run ensembles of simulations with slightly different physics/parameterizations (see note 2). Item 1 was discussed in the last article and I have not been able to find any discussion of this timescale in climate science papers (that doesn’t mean there aren’t any, hopefully someone can point me to a discussion of this topic). Item 2 is something that I believe climate scientists are very interested in. The limitation has been, and still is, the computing power required. Item 3 is what I want to discuss in this article, around the paper by Rowlands et al. In the latest generation of coupled atmosphere–ocean general circulation models (AOGCMs) contributing to the Coupled Model Intercomparison Project phase 3 (CMIP-3), uncertainties in key properties controlling the twenty-first century response to sustained anthropogenic greenhouse-gas forcing were not fully sampled, partially owing to a correlation between climate sensitivity and aerosol forcing, a tendency to overestimate ocean heat uptake and compensation between short-wave and long-wave feedbacks. This complicates the interpretation of the ensemble spread as a direct uncertainty estimate, a point reflected in the fact that the ‘likely’ (>66% probability) uncertainty range on the transient response was explicitly subjectively assessed as −40% to +60% of the CMIP-3 ensemble mean for global-mean temperature in 2100, in the Intergovernmental Panel on Climate Change (IPCC) Fourth Assessment Report (AR4). The IPCC expert range was supported by a range of sources, including studies using pattern scaling, ensembles of intermediate-complexity models, and estimates of the strength of carbon-cycle feedbacks. 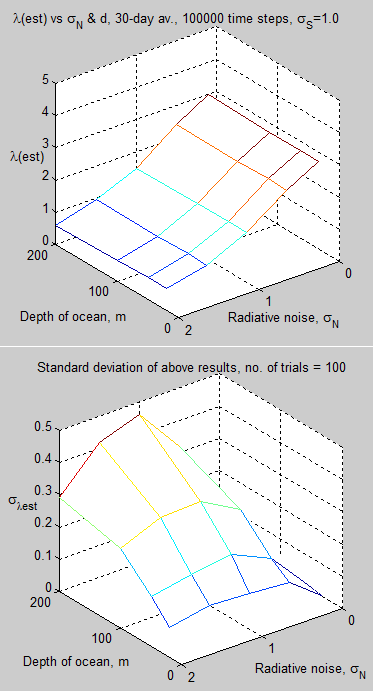 From this evidence it is clear that the CMIP-3 ensemble, which represents a valuable expression of plausible responses consistent with our current ability to explore model structural uncertainties, fails to reflect the full range of uncertainties indicated by expert opinion and other methods..
..Perturbed-physics ensembles offer a systematic approach to quantify uncertainty in models of the climate system response to external forcing. Here we investigate uncertainties in the twenty-first century transient response in a multi-thousand-member ensemble of transient AOGCM simulations from 1920 to 2080 using HadCM3L, a version of the UK Met Office Unified Model, as part of the climateprediction.net British Broadcasting Corporation (BBC) climate change experiment (CCE). 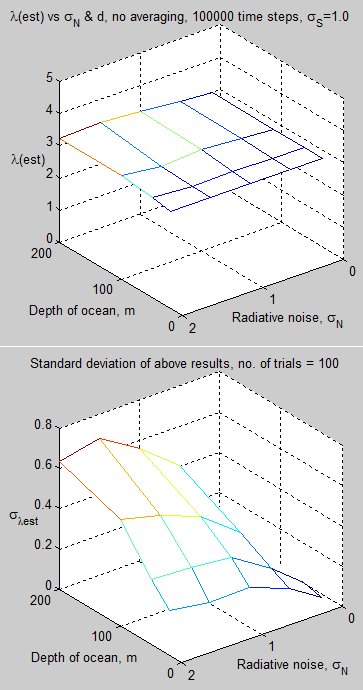 We generate ensemble members by perturbing the physics in the atmosphere, ocean and sulphur cycle components, with transient simulations driven by a set of natural forcing scenarios and the SRES A1B emissions scenario, and also control simulations to account for unforced model drifts. [Emphasis added]. So this project runs a much larger ensemble than the CMIP3 models produced for AR4. Figure 1 shows the evolution of global-mean surface temperatures in the ensemble (relative to 1961–1990), each coloured by the goodness-of-fit to observations of recent surface temperature changes, as detailed below. 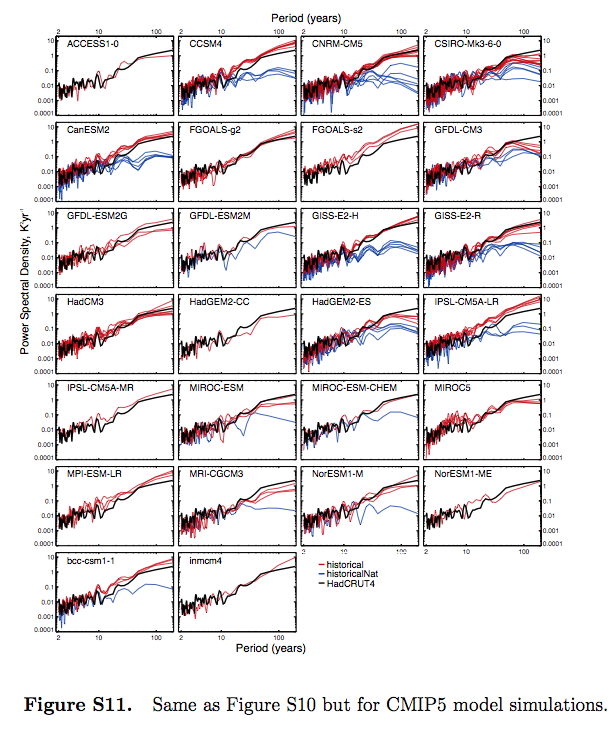 The raw ensemble range (1.1–4.2 K around 2050), primarily driven by uncertainties in climate sensitivity (Supplementary Information), is potentially misleading because many ensemble members have an unrealistic response to the forcing over the past 50 years. ..On the assumption that models that simulate past warming realistically are our best candidates for making estimates of the future.. If model simulations give us probabilistic forecasts of future climate, why are climate model simulations “compared” with the average of the last few years current “weather” – and those that don’t match up well are rejected or devalued? It seems like an obvious thing to do, of course. But current averaged weather might be in the top 10% or the bottom 10% of probabilities. We have no way of knowing. Let’s say that the current 10-year average of GMST = 13.7ºC (I haven’t looked up the right value). Suppose for the given “external” conditions (solar output and latitudinal distribution, GHG concentration) the “climate” – i.e., the real long term statistics of weather – has an average of 14.5ºC, with a standard deviation for any 10-year period of 0.5ºC. That is, 95% of 10-year periods would lie inside 13.5 – 15.5ºC (2 std deviations). If we run a lot of simulations (and they truly represent the climate) then of course we expect 5% to be outside 13.5 – 15.5ºC. If we reject that 5% as being “unrealistic of current climate”, we’ve arbitrarily and incorrectly reduced the spread of our ensemble. If we assume that “current averaged weather” – at 13.7ºC – represents reality then we might bias our results even more, depending on the standard deviation that we calculate or assume. We might accept outliers of 13.0ºC because they are closer to our observable and reject good simulations of 15.0ºC because they are more than two standard deviations from our observable (note 3). The whole point of running an ensemble of simulations is to find out what the spread is, given our current understanding of climate physics. Let me give another example. One theory for initiation of El Nino is that its initiation is essentially a random process during certain favorable conditions. Now we might have a model that reproduced El Nino starting in 1998 and 10 models that reproduced El Nino starting in other years. Do we promote the El Nino model that “predicted in retrospect” 1998 and demote/reject the others? No. We might actually be rejecting better models. We would need to look at the statistics of lots of El Ninos to decide. Here’s a couple of papers that don’t articulate the point of view of this article – however, they do comment on the uncertainties in parameter space from a different and yet related perspective. 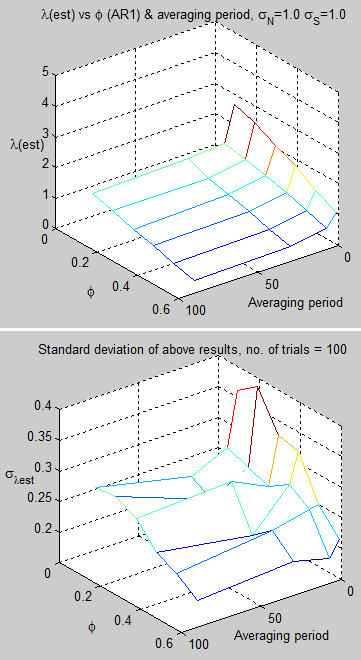 Methods of testing these models with observations form an important part of model development and application. Over the past decade one such test is our ability to simulate the global anomaly in surface air temperature for the 20th century.. Climate model simulations of the 20th century can be compared in terms of their ability to reproduce this temperature record. This is now an established necessary test for global climate models. Of course this is not a sufficient test of these models and other metrics should be used to test models..
..A review of the published literature on climate simulations of the 20th century indicates that a large number of fully coupled three dimensional climate models are able to simulate the global surface air temperature anomaly with a good degree of accuracy [Houghton et al., 2001]. For example all models simulate a global warming of 0.5 to 0.7°C over this time period to within 25% accuracy. 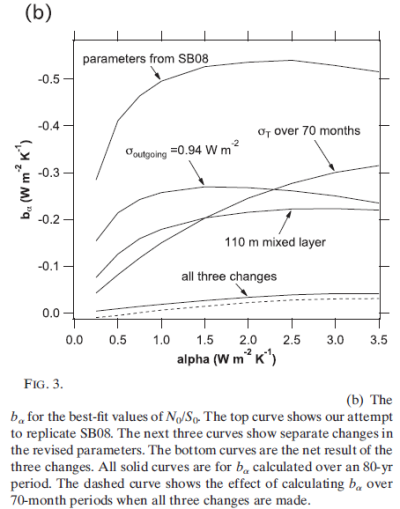 This is viewed as a reassuring confirmation that models to first order capture the behavior of the physical climate system..
One curious aspect of this result is that it is also well known [Houghton et al., 2001] that the same models that agree in simulating the anomaly in surface air temperature differ significantly in their predicted climate sensitivity. The cited range in climate sensitivity from a wide collection of models is usually 1.5 to 4.5°C for a doubling of CO2, where most global climate models used for climate change studies vary by at least a factor of two in equilibrium sensitivity. 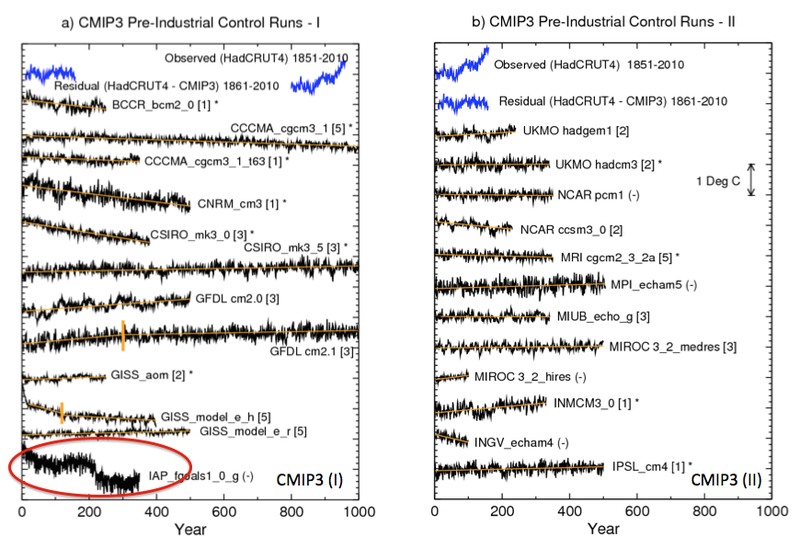 The agreement between the CMIP3 simulated and observed 20th century warming is indeed remarkable. 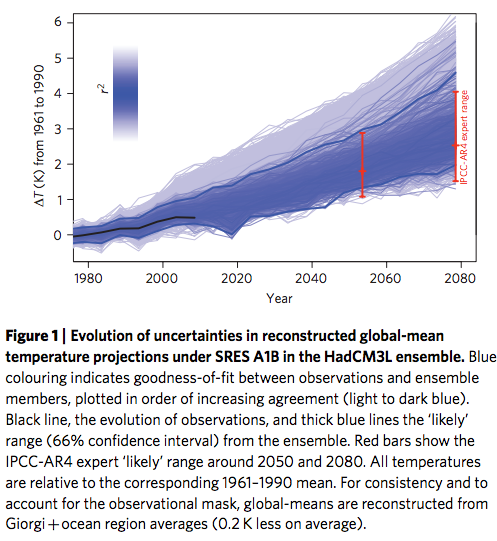 But do the current models simulate the right magnitude of warming for the right reasons? How much does the agreement really tell us? Kiehl  recently showed a correlation of climate sensitivity and total radiative forcing across an older set of models, suggesting that models with high sensitivity (strong feedbacks) avoid simulating too much warming by using a small net forcing (large negative aerosol forcing), and models with weak feedbacks can still simulate the observed warming with a larger forcing (weak aerosol forcing). Climate sensitivity, aerosol forcing and ocean diffusivity are all uncertain and relatively poorly constrained from the observed surface warming and ocean heat uptake [e.g., Knutti et al., 2002; Forest et al., 2006]. 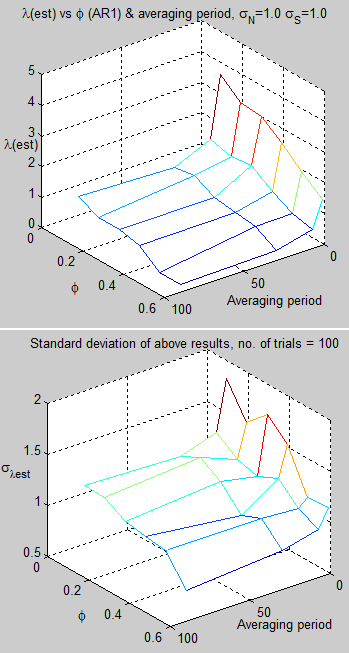 Models differ because of their underlying assumptions and parameterizations, and it is plausible that choices are made based on the model’s ability to simulate observed trends..
..Models, therefore, simulate similar warming for different reasons, and it is unlikely that this effect would appear randomly. 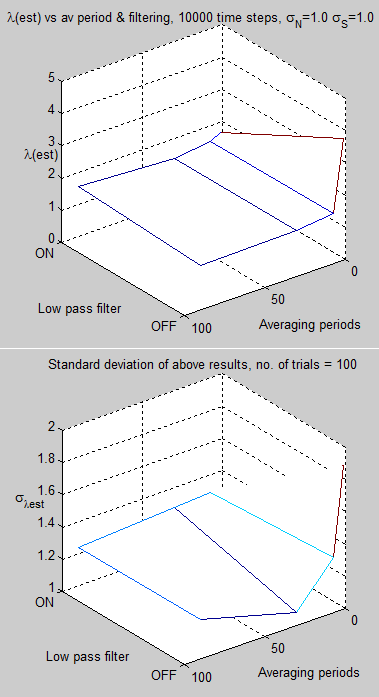 While it is impossible to know what decisions are made in the development process of each model, it seems plausible that choices are made based on agreement with observations as to what parameterizations are used, what forcing datasets are selected, or whether an uncertain forcing (e.g., mineral dust, land use change) or feedback (indirect aerosol effect) is incorporated or not. ..Second, the question is whether we should be worried about the correlation between total forcing and climate sensitivity. Schwartz et al. recently suggested that ‘‘the narrow range of modelled temperatures [in the CMIP3 models over the 20th century] gives a false sense of the certainty that has been achieved’’. Because of the good agreement between models and observations and compensating effects between climate sensitivity and radiative forcing (as shown here and by Kiehl ) Schwartz et al. concluded that the CMIP3 models used in the most recent Intergovernmental Panel on Climate Change (IPCC) report [IPCC, 2007] ‘‘may give a false sense of their predictive capabilities’’. 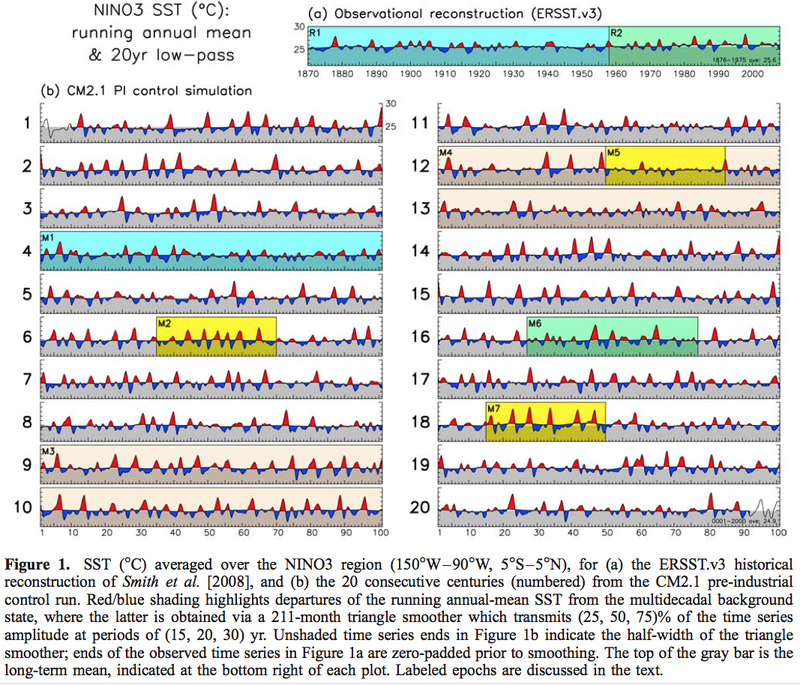 Here I offer a different interpretation of the CMIP3 climate models. They constitute an ‘ensemble of opportunity’, they share biases, and probably do not sample the full range of uncertainty [Tebaldi and Knutti, 2007; Knutti et al., 2008]. The model development process is always open to influence, conscious or unconscious, from the participants’ knowledge of the observed changes. It is therefore neither surprising nor problematic that the simulated and observed trends in global temperature are in good agreement. a) climate, as the long term statistics of weather, can be reliably obtained over these time periods. Remember that with a simple chaotic system where we have “deity like powers” we can simulate the results and find the time period over which the statistics are reliable. b) climate, as the 10-year (or 20-year or 30-year) statistics of weather is tightly constrained within a small range, to a high level of confidence, and therefore we can reject climate model simulations that fall outside this range. Given that this Rowlands et al 2012 is attempting to better sample climate uncertainty by a larger ensemble it’s clear that this answer is not known in advance. There are a lot of uncertainties in climate simulation. Constraining models to match the past may be under-sampling the actual range of climate variability. Models are not reality. But if we accept that climate simulation is, at best, a probabilistic endeavor, then we must sample what the models produce, rather than throwing out results that don’t match the last 100 years of recorded temperature history. Note 1: We are using the ideas that have been learnt from simple chaotic systems, like the Lorenz 1963 model. There is discussion of this in Part One and Part Two of this series. As some commenters have pointed out that doesn’t mean the climate works in the same way as these simple systems, it is much more complex. The starting point is that weather is unpredictable. With modern numerical weather prediction (NWP) on current supercomputers we can get good forecasts 1 week ahead. But beyond that we might as well use the average value for that month in that location, measured over the last decade. It’s going to be better than a forecast from NWP. The idea behind climate prediction is that even though picking the weather 8 weeks from now is a no-hoper, what we have learnt from simple chaotic systems is that the statistics of many chaotic systems can be reliably predicted. Note 2: Models are run with different initial conditions as well. My only way of understanding this from a theoretical point of view (i.e., from anything other than a “practical” or “this is how we have always done it” approach) is to see different initial conditions as comparable to one model run over a much longer period. That is, if climate is not an “initial value problem”, why are initial values changed in each ensemble member to assist climate model output? 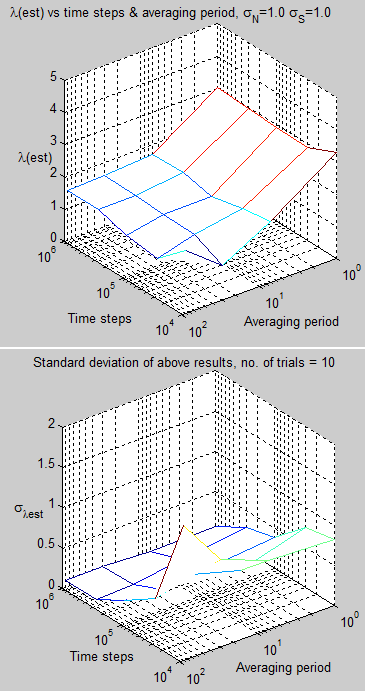 Running 10 simulations of the same model for 100 years, each with different initial conditions, should be equivalent to running one simulation for 1,000 years. Well, that is not necessarily true because that 1,000 years might not sample the complete “attractor space”, which is the same point discussed in the last article. Note 3: Models are usually compared to observations via temperature anomalies rather than via actual temperatures, see Models, On – and Off – the Catwalk – Part Four – Tuning & the Magic Behind the Scenes. The example was given for simplicity.